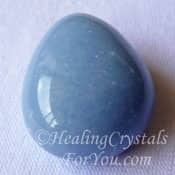 Ajoite is a highly spiritual stone that emits the loving energy of the Goddess and of Mother Gaia, aiding sweet loving communication with Spirit and the Angels. 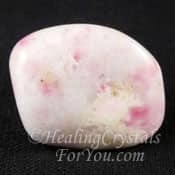 This is an excellent healing crystal for you to put to use as it has a strong feminine energy from the Goddess, that stimulates forgiveness, and aids healing of karmic wounds from past lives. 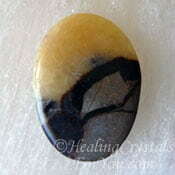 It often occurs in quartz and is a lovely emotionally supportive stone, especially for women. 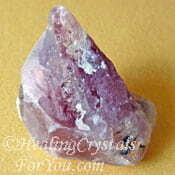 This crystal embodies positive metaphysical properties that aid healers and bring peace and harmony. Use in meditation to elevate you to the spiritual realms where you can meet with the angels and speak with spirit. Then allow its energy to aid you to communicate that wisdom to those on the earth plane. The meaning of the name of this stone comes from Ajo, Arizona USA where it was first discovered. It may also be called Ajo Quartz when it occurs as an inclusion in quartz. It has also been found in Zimbabwe and South Africa. 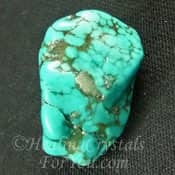 It is now becoming hard to find, even rare, to get this stone on its own, on a stone matrix, but it is more readily available as a turquoise blue, or blue-green inclusion in quartz. 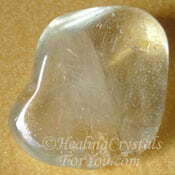 When seen in quartz, the inclusion may translucent, as phantoms or patches in the stone. Even though the stone itself is now classified as rare, they are readily available in quartz at good crystal suppliers. The specimen pieces of this stone will be expensive, but usually small pieces can be found at an affordable price. It is now more common to get it mixed with other stones, within the quartz. This mixture may be with Hematite, Shattuckite or the very rare Papagoite. 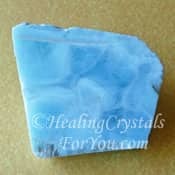 In some stones, the Ajoite within the quartz seems to have a resemblance to angel wings, and these are very special. The vibration of any of these beautiful crystals makes them a stone that is worth going to an effort to obtain. 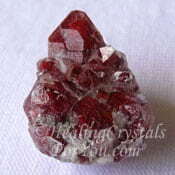 These crystals have a sweet and high vibration, that simply immerses you in pure loving energy from the Goddess. This lovely stone vibrates within all of the chakras from the heart chakra up, including the thymus or higher heart chakra. The higher heart chakra is about the energy of Divine love. 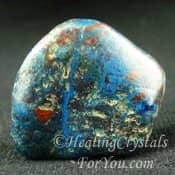 This stone provides the most amazing energy of love, that the Goddess could implant into a stone. 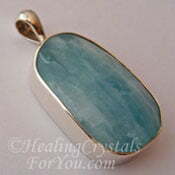 The energy of Ajoite in Quartz is a strong and deeply cherishing feminine vibration. 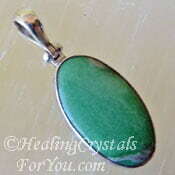 Its energy gently encourages you to embrace the feeling of forgiveness, a strong higher heart chakra attribute. This is a highly spiritual vibration, as it requires you to feel compassion and forgiveness for others and for yourself, before you can move your spiritual growth forward. Once you clear many of these old energies, you may move upwards in your journey, and embrace the power of the higher vibrations. 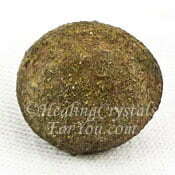 This lovely stone helps you to clear stress from your body, and to begin to return your body to perfect physical health. Although the energy of this stone is mainly within these higher chakras, it has a powerful effect within the entire body. It will clear all of the chakras of any disharmonious energy. It may aid your Lightbody to unite with the physical body. Any pain or attachments of negative entities will be gently released by its vibration, bringing a quiet and peaceful change within your entire body. 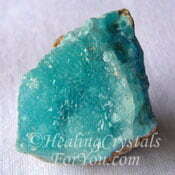 Ajoite allows you to perceive and understand the reasons for past life situations. It also encourages old karmic wounds or implants to be released by the power of its energy. Specifically it is said to particularly help to release implants from the Atlantian and Lemurian civilizations, and the associated karma that you have been carrying. It also facilitates filling the space they were occupying with unconditional love and peace from the Goddess. The vibration of this loving stone within the throat area, may clear and energize the throat chakra, and stimulate you to communicate with truth. So that you are more easily able to communicate your truth from your hearts perspective, its energy will unite the energy of the throat chakra with that of the heart chakra. 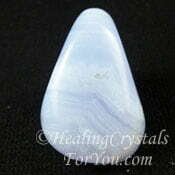 Ajoite is a strong communication stone, that will open the throat chakra. It then aids the flow of spiritual communication down from the higher transpersonal chakras, via the soul star chakra, into the crown chakra and the third eye chakra. Often this spiritual or psychic communication may be in the form of psychic knowing which is receiving thoughts directly from spirit. 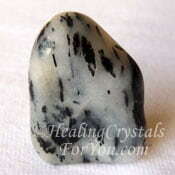 This is an excellent stone for spiritual teachers to use. It allows for you to have a strong ability to concentrate, so that you can give your undivided attention to what you are doing. 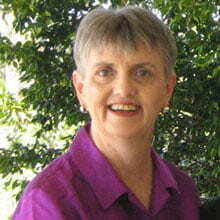 The gift of psychic knowing is closely related to channelled writing. This can be developed by doing daily journaling, to allow you to receive written communication directly from spirit. Keeping this stone in your auric field is all that is required, to have its vibration begin to resonate within your etheric body. 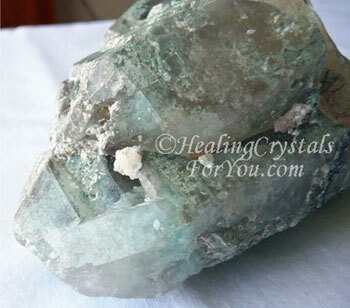 It is possible to obtain Ajoite specimens from specialist suppliers of crystals, even though this crystal is not always easy to buy. The loving frequency of this crystal enhances guidance from Divine sources, including connecting with angels and other members of the Angelic realm. 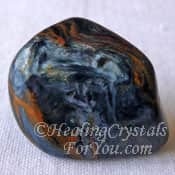 If you work in any area where you communicate spiritual truths, including any type of psychic employment, or channeling, this stone will strongly benefit you. They will enhance creativity and will aid manifestation by removing self limiting beliefs, that have been holding you back from your highest good. Learn methods to meditate as doing this is an excellent method to aid stress relief. Combine this stone with daily meditation. This will help to release anger, and is especially powerful to eliminate jealously and other strong negative emotional reactions, that are the cause of many of the world's problems. They are stones that may encourage bonding between people of disparate views, that may otherwise have had difficulty making friends. Ajoite is a lovely stone of the Goddess that will fill your life with the loving emotional support of the feminine principle. 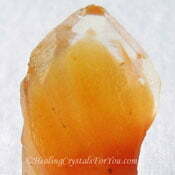 It is a crystal that will help you to make contact with the angelic realms. This makes it an excellent aid to move your life to a place where you can gain their assistance in many ways from these powerful beings. While being sweetly and lovingly supportive, it is also a stone to move your spiritual growth gently to a new and higher level. "Knowledge can bring many things, but the consciousness of the heart brings love, and love brings everything." Harold Klemp. Ajoite with Shattuckite, seen in the image on the right, occurs naturally and is a lovely mixture. 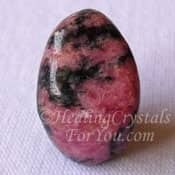 It is an excellent stone to wear, as it promotes loving and peaceful feelings. 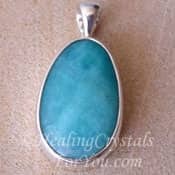 The vibration of the Ajoite enhances the Shattuckite energy, and this mixture will protect against psychic attack, so it is a strong stone for protecting you in a psychic sense. It also helps to protect you against the electromagnetic vibrations given off by microwaves, and other electrical appliances. 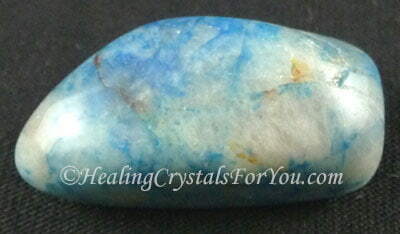 Like Ajoite in quartz, it is a strong stone for karmic healing, releasing the need for reparation and freeing the soul. 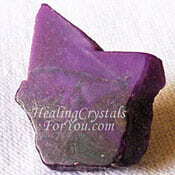 Although this is a lovely stone to use alone, it may be combined with any of the higher chakra stones. The addition of this stone will help to bring through an increase in the loving energy of the Goddess, any time you use any of your crystals. 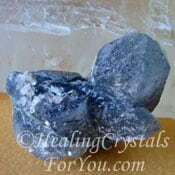 To aid communication with the angelic realms, use it with Angel Phantom Quartz, Angelite aka Blue Anhydrite or Larimar. As you open yourself up to allowing yourself to forgive both yourself and others it will aid you to feel the love of the Goddess more deeply. 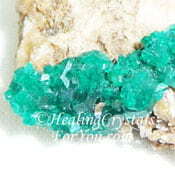 Use it with Dioptase, Rhodonite, Green Calcite, Green Apophyllite or Variscite if you are working on forgiveness issues. Blizzard Stone also known as Gabbro, is one of the strong grounding stones you may combine with it, as it not only aids grounding, but is helpful to magnify this stones energy. When its combined with Hematite, it may be used to heal and strengthen the blood, and use it with Boji Stone to ground your energy. 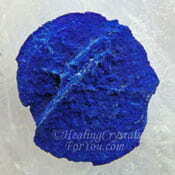 It will boost this stones energy to communicate with truth when used with Azurite, Turquoise, Clear Topaz or Amazonite. Use this quartz crystal to amplify the energy of other stones used for communication with the Goddess, including other blue throat chakra stones. Stones such as Thulite, Blue Aragonite, Blue Topaz, Chrysocolla, Lepidocrocite, Septarian stones, Amazonite, Blue Lace Agate, Pietersite or Aquamarine combine well with it. 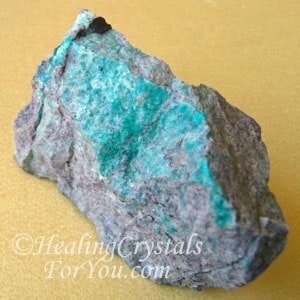 To assist you to develop your channeling abilities, combine this stone with other channeling stones such as Quantum Quattro, Shattuckite, Yttrium Fluorite, blue colored Hemimorphite, Sugilite or Blue Tourmaline.